The Kolob Canyons in Zion National Park are one of southern Utah’s most spectacular landmarks and are the backdrop for New Harmony’s Holiday House. Relax at the house and gaze into these magnificent canyons, or take a 5 minute drive and you are immersed in Zion National Park. Harmony House is conveniently located between Cedar City, known for its Tony Award winning Shakespeare Festival, and St. George, known for it’s great climate and an abundance of recreational opportunities. Slightly further, but still within an hour or two drive, you can reach Bryce Canyon National Park, Cedar Breaks Monument, Brian Head Ski Resort, Lake Powell, the North Rim of Grand Canyon, or head south to Mesquite or Las Vegas, Nevada. Harmony House is a ranch style floor plan with no stairs. It has vaulted ceilings, a fully equipped kitchen, a reading library, 3 large bedrooms (1 king, 1 queen, 2 twin beds), 2 full bathrooms, washer/dryer and 2 car garage for secure parking. We are pleased to offer this family friendly home with indoor games such as foosball, air hockey, and plenty of board games. Outside enjoy spectacular sunrises over the Kolob formations and colorful sunsets behind the scenic Pine Mountains. 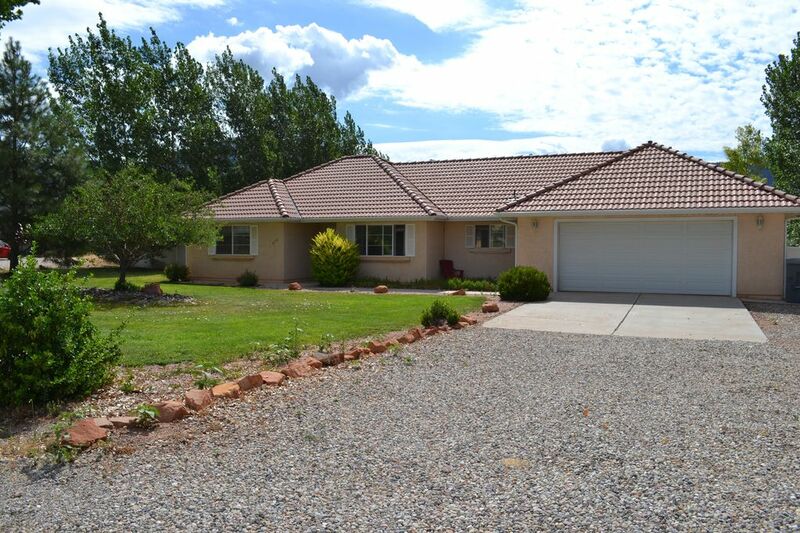 The one acre property is fenced and lined with trees for privacy. A play structure offers on-site fun for children. Your entire family will enjoy the beautiful scenery and the comforts of home during your holiday in southern Utah. We purchased this home brand new in 1999 and we love it! We are both educators who love the outdoors. Zion National Park is a beautiful place filled with places you could spend a lifetime exploring. Harmony House is conveniently located 5 minutes from the Kolob Canyons section of Zion National Park. The northern section of the park has great hiking and is less crowded than the springdale area, which is a 40 minute drive to the southeast. Our favorite trails in the Kolob Canyons area include Taylor Creek, Kolob Arch, Timber Creek Overlook, Spring Canyon, and Kanarraville Falls. The house allows easy access to other surrounding National Parks and Monuments, including Bryce Canyon, Grand Canyon, Lake Powell, Cedar Breaks, and the Grand Staircase. Come experience the sanctuary of the Kolob Canyons and the Harmony House. Harmony House sits in the beautiful New Harmony Valley on an acre of land surrounded by trees with exceptional views into Zion National Park and the Pine Valley Mountains. Sit on the back patio and gaze into the park as you listen to the breeze through the trees. At night the stars are like you have never experienced. The milky way is clearly visible. A full moon rise over the Kolob Canyons is something you will never forget. A very peaceful place that is sure to be restorative. Immerse yourself in the natural beauty of southern Utah. House looks directly into the Kolob Canyons of Zion. The view to the west looks into the Pine Valley Mountains. The house has high speed wifi internet. Traditional coffee maker and k-cup machine. 45 minutes to Brian Head Resort. 1 hour 15 minutes to Eagle Point Resort. 30 minutes to the world class courses in St. George. It was a perfect home to come back to after exploring the area each day. Beautiful views out the front and back of the house to enjoy. The house was clean, comfortable, and had all of the amenities of home. We loved our time at Harmony House and hope to stay again in the future. Wonderful home in an amazing location! Very close to the quiet side of Zion, entrance to Kolob canyons just 5 minutes away. We enjoyed several beautiful hikes near the house, and traveled to main entrance of Zion as well. The home is very comfortable, clean and nicely decorated. The house has everything you may need while on vacation, so we just felt right at home! Thank you! This was the perfect place four our family of four! Hi, we would highly recommend this home to anyone especially families with kids. It was a great home base to see Zion and Bryce Canyon. The home had everything we needed with great views. The property was beautiful. Everything was well maintained. Could not have had a nicer place to stay. A bright, modern home. The lay out was terrific for a family. It included everything you needed. Having a young child and a baby the games, toys, and books were a blessing. It was perfect having it conveniently near Zion. A quiet area with much to do! I would highly recommend this lovely home. Our Kolob Canyon hikes were greatly enjoyed giving us the beauty of Zion without the crowds. This is a great place to stay. Weekly rate includes 7 nights (last night is free! ).